It's time again for my quarterly review of smartphone market share trends around the globe. While I initially considered doing this semi-annually, I've been requested to make it a quarterly feature. As always, Q1 2013 data is sourced from Gartner and Kantar Worldpanel reports and complemented with reports from other research houses as and when available. 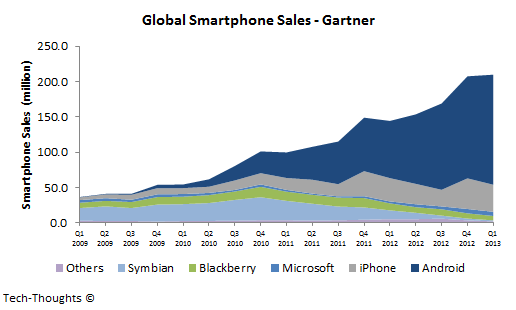 The chart above shows Gartner's global smartphone market share data for the last four years. The trend is unmistakable, as legacy platforms like Symbian and Blackberry have been practically wiped out. Android has continued to extend its dominance and now accounts for nearly 75% of smartphone sales. The launch of highly anticipated devices like the Galaxy S4 at the high-end and dropping price points at the low-end should help Android devices consolidate their position over the next two quarters. Meanwhile, as I had predicted, the iPhone's market share declined to ~18% (compared to ~23% in Q1 2012). The iPhone's growth slowdown has been driven by increasing cyclicality in sales as its target market has become more saturated. Finally, Blackberry and Windows Phone just managed to grab 3% and 3.5% of Q1 smartphone sales. Thanks to the iPhone 5 launch, the iPhone had temporarily surpassed Android smartphone shipments in Q4 2012. As I expected, this trend lasted for just one quarter as Android regained the lead in Q1. Because of the unique pricing structure, the US smartphone market is very different and far more "launch driven" than the rest of the world. As a result, the US is the only remaining smartphone market in the world that can be considered a "duopoly" at this point. However, the nature of the market is also likely to cause a Galaxy S4-driven launch hysteria, giving a boost to the Android platform's market share until the next iPhone launch. Interestingly, Nokia & Windows Phone seem to have finally gained some traction in the US, breaking past 5% market share for the first time - However, this could also be a temporary, launch driven anomaly. 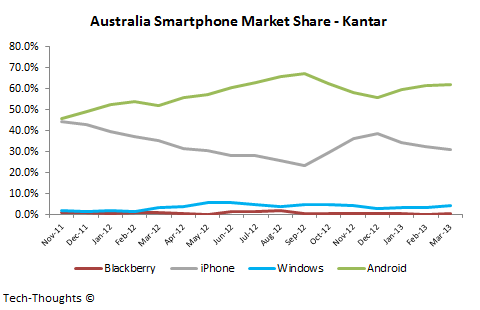 The Android platform dominates both Europe (~70%) and Australia (>60%), with the iPhone in second place. The trend seen in both markets is fairly similar, as the iPhone gave back pretty much all of the market share gains from the iPhone 5 launch. Windows Phone has made some very modest gains and holds just 4-6% in these markets. 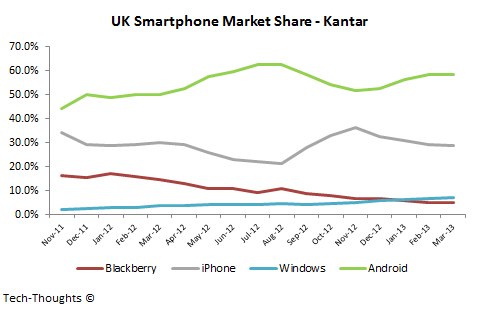 Smartphone market share trends in the UK are almost an exact replica of those in Australia. The Android platform extended its lead to nearly 60% as iPhone sales weakened after the iPhone 5 launch. Meanwhile, Windows Phone has seen steady growth to reach ~ 7% of smartphone sales. 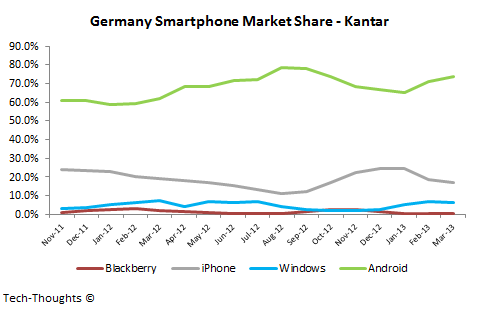 Market share trends in the German smartphone market are, again, very similar to those in UK & Australia as iPhone sales predictably declined in Q1. However, the overall market share of the Android platform (>70%) in the German market is much higher than that in the UK & Australia. The interesting trend in the chart above is the state of Windows Phone – The platform had seen decent growth over the past few months, but saw a surprising decline in March. 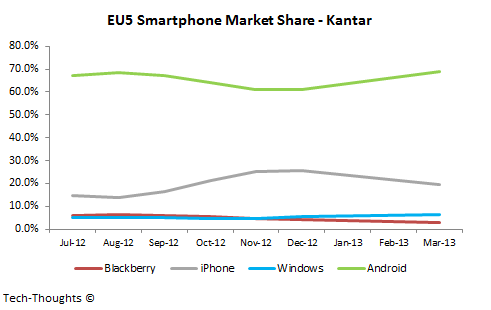 It will be interesting to watch the sustainability of Windows Phone’s market share over the next few quarters. 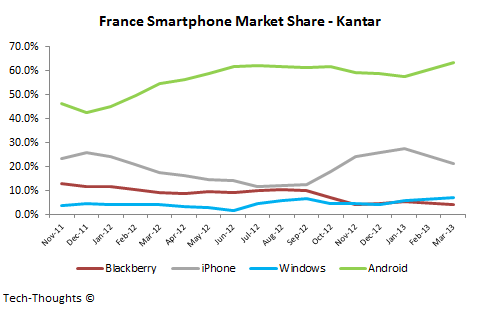 The French smartphone market shows a far steeper market share trend for the Android platform than UK or Germany. iPhone sales saw a sharp sequential decline, while Windows Phone, again, saw steady growth to reach ~7% of the market. Italy: The “Third Platform” Exists? 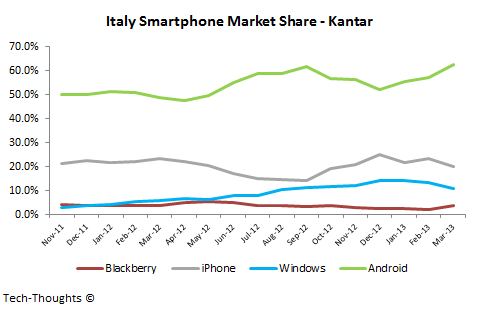 The Italian smartphone market is one of the “outliers” in Europe. Not because of market leadership (Android still leads with more than 60%, with the iPhone in second), but because of it is one of the only markets that has a semblance of a “third platform”. 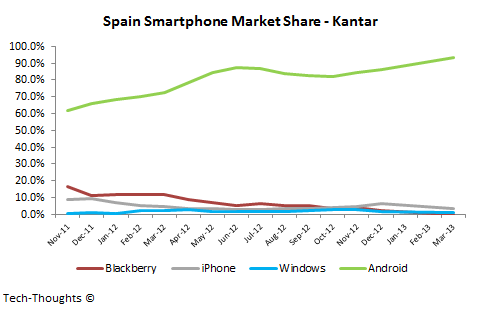 Windows Phone, surprisingly, holds more than 10% of the market here. 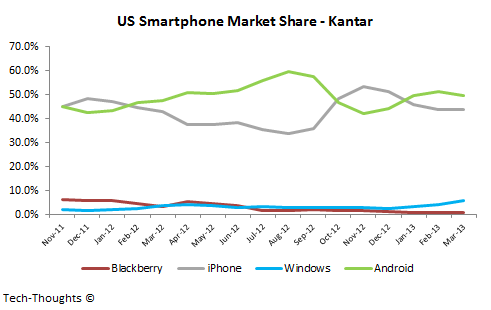 However, Windows Phone’s market share has declined over the last few months (from ~15%). This may be another market to watch to gauge Windows Phone’s “staying power”. Spain is the other “outlier” among EU5 nations, but for very different reasons when compared to Italy. The country is completely dominated by Android, which has cornered well over 90% of the market. All competing platforms, including the iPhone and Windows Phone, seem to fighting for scraps. Windows Phone’s struggles are especially interesting, given the price sensitivity in the market. China has consistently been dominated by Android devices, mostly without Google services. However, local Android appstores fill the gap admirably. 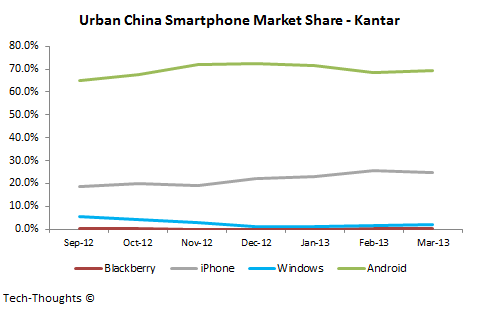 The chart above shows the state of the smartphone market in Urban China, where Android has consistently held ~70% of the market. If we include data from across the country (from Analysys), the scales tip even more convincingly in favor of Android. Windows Phone's struggles in China are interesting, given the fact that their presence in other markets is purely driven by first time smartphone buyers. This is probably driven by aggressive pricing of Android devices by Chinese OEMs. This dynamic is beginning to make an impact in markets like China and India, but I expect it to be a global phenomenon soon enough.